So when I started this blog post my ideas was to list and describe all of the necessary things you need to do after a devastating storm. I didn’t want to create a laundry list of what you should have done before the storm. At this point, it’s too late and maybe in poor taste as folks are trying to get their lives back. Right now, in Houston, we needed something that helped businesses recover. I spent some time volunteering last week at Common Threads but felt that wasn’t enough. Since I am no good with a hammer and my services are rather abstract, I thought that one way I could help was to create a website that will gather various recovery resources that directly benefit businesses. 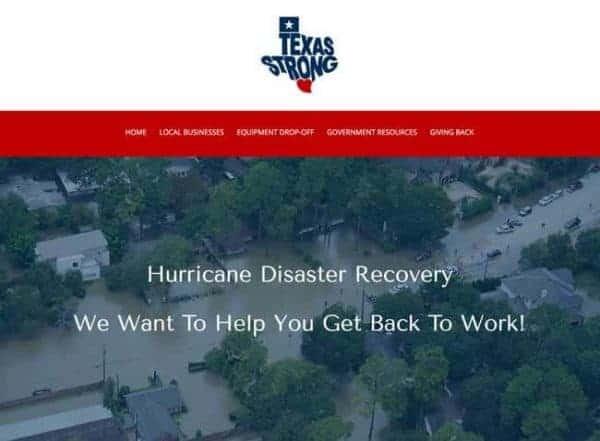 I created the Hurricane Business Recovery website to collect various government and private resources and donations sites. Things like donating office equipment, shredding destroyed computers, and office space are being offered but not many people know about it. Shout out to Growthli, a Houston-based co-working and learning center, for all they are doing! I hope to keep adding local Houston businesses that are doing what they can to help other companies get back to work. If you know of anyone or any company that is donating their time, their business services or is accepting donations on behalf of businesses, please complete this Google form; https://gxweb.site/hurricaneharvey-addabusinesslisting. We’d love to add more! Wow! This is an extraordinary idea for Houston, and any of the areas devastated by recent natural disasters. Good for you, Christina Hawkins. Nice idea! Really happy for you Christina. Great hope in the midst of disaster.